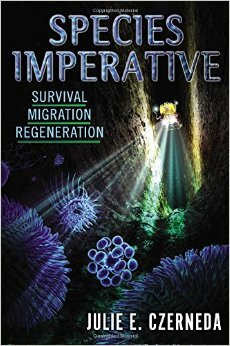 Regeneration by Julie Czerneda, and GIVE AWAY of Species Imperative Omnibus! Thanks to Julie Czerneda’s publishers, I’ve got a copy of the Species Imperative Omnibus to give away to one lucky reader! Scroll to the bottom of this post for more information on the give away. It’s hard to get into the plot of Regeneration without spoiling things that happened in the previous books, so I’m going to try to keep the plot-talk very light. The super quick oversimplified plot introduction is that in the not too distant future we have become part of the Interspecies Union, which is exactly what it sounds like. Thanks to no-space transit technology provided by the multi-dimensional Ro, and the Sinzi who administrate it, hundreds of galactic species can travel all over the place. Brymn, a Dhryn researcher, seeks out the Earthbound salmon researcher Dr. Mackenzie Connor (Mac to her friends), for help with how to save his species. 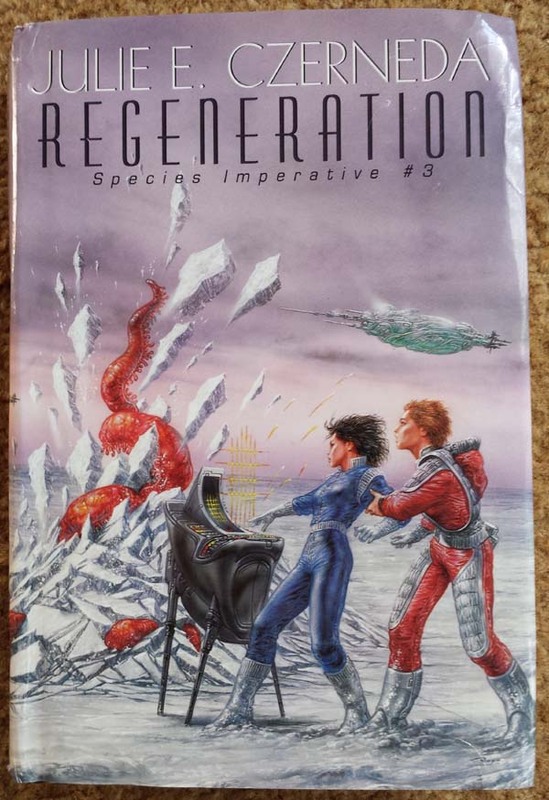 In Regeneration, the final book of the Species Imperative trilogy, while most governments are trying to figure out a weapon of mass destruction (or extinction) that can be used against the Dhryn, Mac and her team are asking questions that are more along the lines of *why*? Why do the Dhryn have this biological urge? What is their biology anyways? Have they always been like this? How and where did they evolve? Can we trust our sources of information? I wish all scifi books had this much science in their fiction. Give this series to a high school kid, and watch them fall in love with biology. How do we handle an invasive species, especially if that species is intelligent and space-faring? How do you study a species that most people (human and alien) have been taught to shoot on sight? I do not think it is possible to cram any more cool bookish stuff into one day. 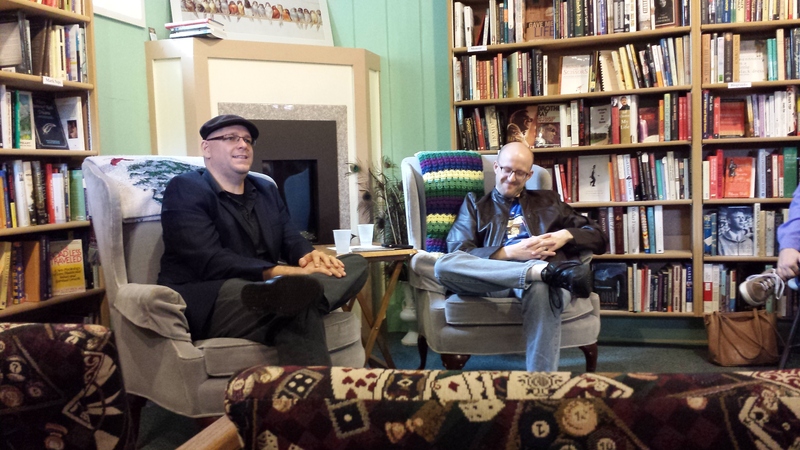 This past Saturday, I started my day at BookBug bookstore, for my friend Andy’s Type-In. Andy collects manual typewriters, at last count he has over twenty. A Type-In is where a bunch of type writer aficionados bring their babies somewhere and show ’em off. And then there’s me, walking around typing up postcards and asking “how do I do an exclamation point? I made a mistake! 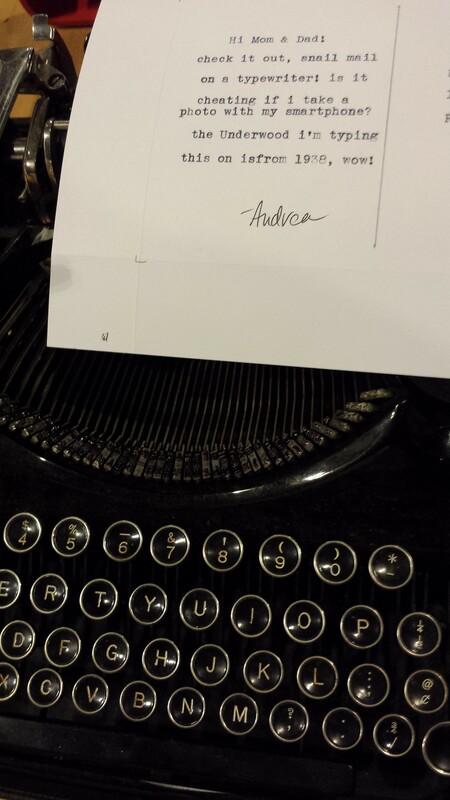 how do I backspace?” I was a <sarcasm>genius</sarcasm> I forgot my really cool postcards at home. Luckily, Andy brought some, and his had cool Type-In logos and bookstore images on them! I better tell my parents to watch their mail box. A couple of hours later, I drove five minutes down the road to Kazoo Books for the Jim C. Hines and Tobias Buckell book signing! I wish I’d gotten a photo of the table covered in Toby and Jim’s books, it was a beautiful display (and pretty empty a few hours later). Jim and Toby have known each other since the beginning of their careers, it was wonderful to just listen to them talk about the challenges and pressures they faced as their careers took off, different types of projects they’ve worked on and are working on, adventures in bookstore signings, how “being an author as a single guy” is pretty different from “being an author as a Dad”, among other things. There was lots of laughing and fist bumping happening. It was a wonderful afternoon. Toby signed my copy of Hurricane Fever, and since I already have signed copies of Jim’s books, I had him sign a paperback of Libriomancer for me to use as as a give away! He even put a sooper seekrit message in it! I’ve got books to give away! But we’re gonna do this the fun way. 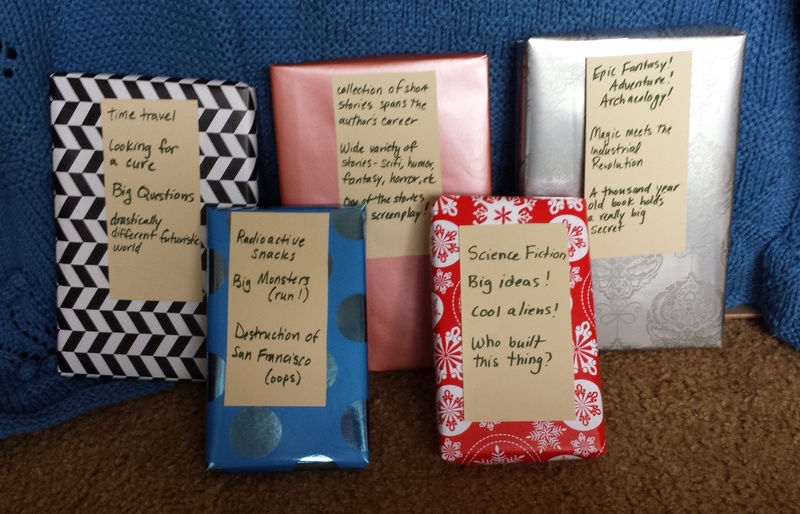 And by fun way, I mean blind date with a book! that means I give you a little bit of info about the book, and you get to decide if it looks interesting. I won’t tell you the title, or the author, but I can tell you that these are all new books published in the last 12 months, from publishers like Orbit, Tachyon, and Titan Books. They were all sent to me as review copies, and either I have duplicates, I’ve read them and don’t plan to read them again, or it’s a title I opted to skip on. – let me know in the comments which book(s) you’re interested in, and yes, you can request more than one. To be eligible, you *must* specify your choices (None of this lazy “they all look good!” stuff), by referring to the wrapping paper color, or one of it’s descriptors, or something useful. If we don’t already know each other, please leave me a way to reach you – twitter, e-mail, etc. – Give away closes midnight, eastern time, Sunday Aug 31st. While you are waiting with baited breath for the two book reviews I’m working on, check out these give aways. Because we all need more books, right? 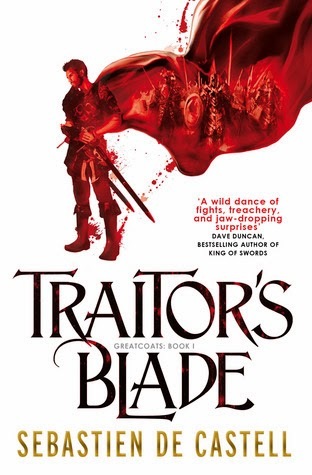 In celebration of World Book Day, Over the Effing Rainbow is giving away a limited edition, signed copy of Sebastien de Castell’s debut Traitor’s Blade. an autographed, numbered copy? holy crap! 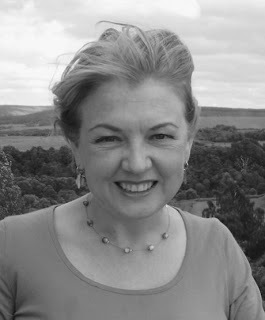 Over at She Wolf Reads, you can win a copy of Thirteen by Kelley Armstrong! You’ve been seeing this banner all over the place, yeah? This is 300 and some pages of unexpected short fiction. Stories that transport you, that surprise you, that burrow behind your eyes and make a home for themselves in the recesses of you mind. Because I know you’d love to have this beautiful book on your bedside table or snuggled into your e-reader, we’ve got some bloggers doing give aways as part of the tour. Act fast, and win yourself a brilliant collection! My Shelf Confessions has a print copy up for grabs (sorry, US only), you’ve got about another week to enter. So what are you waiting for? 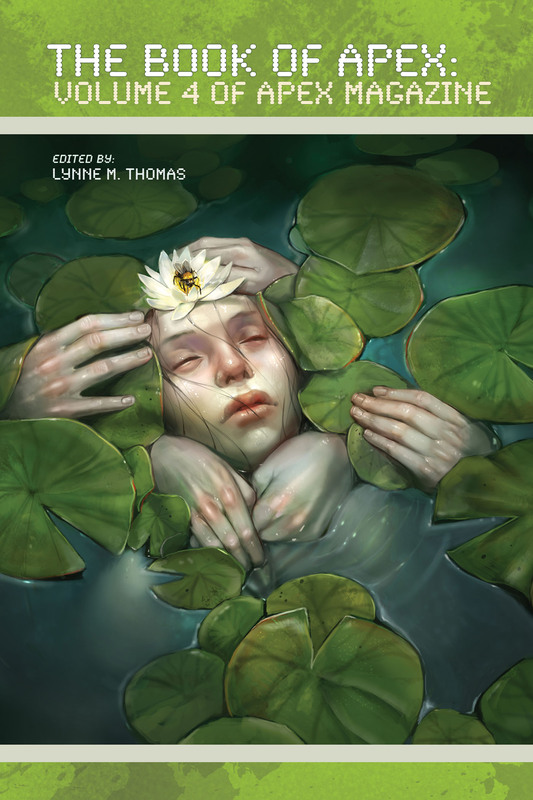 Go get yourself some unforgettable short fiction! Thanks to the wonderful folks at Orbit Books, I have an extra copy of Robert Jackson Bennett’s supernatural thriller (and mind blowing masterpiece) AMERICAN ELSEWHERE. 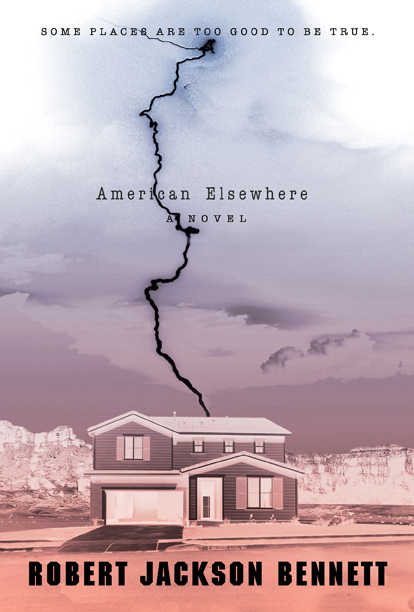 I absolutely loved AMERICAN ELSEWHERE, you can read my review here, and you can read an excerpt from the book over here at Orbit. 1. to enter, comment on this post. when you sign in to comment, make sure you leave me your e-mail address, or a twitter, or some other way to get a hold of you. 2. give away is open to all residents of planet Earth. Orbit was kind enough to send me 2 copies of this book, the least I can do is pay for some shipping someone else can enjoy this amazing novel. 3. give away closes at midnight, eastern time, on Tuesday February 19th, and the winner will be announced and contacted shortly afterwards. 4. be warned. this book will completely blow your mind. 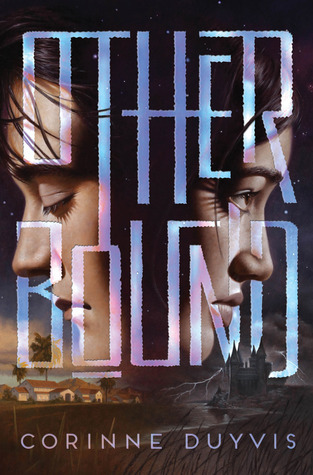 I am not responsible if you get absolutely no sleep while you are reading this book, are late to work, or generally ignore your family while reading.